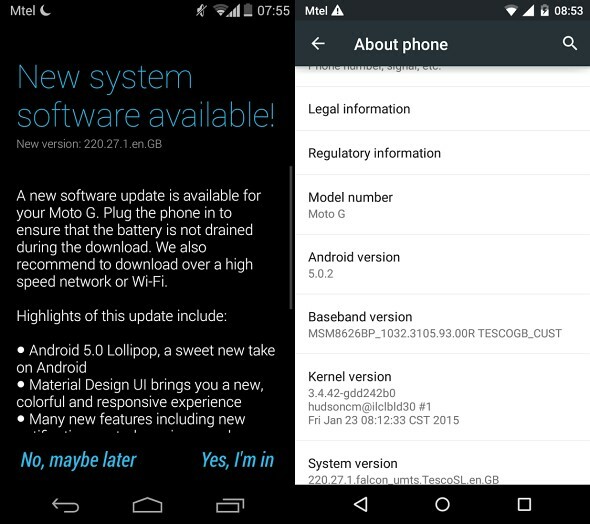 Bringing Lollipop to Motorola devices has proven to be a quite difficult and lengthy endeavor. Users of various Moto devices have had mixed luck with the OS update and various reports have been pouring in from all around the world during the last few months. The original Moto E and the Moto Maxx have recently received Lollipop and so have certain Moto X (2014) variants. But the whole situation is rather messy, especially with first-gen models. Soak tests have been going on for a while stretching over several different builds, including Android 5.0, 5.0.1, 5.0.2 and even 5.1. One of our readers, today, reports that the original Moto G (2013), that is the X1032 model, is receiving Lollipop 5.0.2 in the UK. The update came a few days after a notification from Motorola Update Services announced that the package will be seeding shortly. There is still no notification of the update, but manually checking the Update menu earlier today, has yielded the long-anticipated result. So if you own a first generation Moto G from the UK, you might just be in luck. Head on over and grab your OTA. And hopefully, this new build will prove good enough for and the update rollout will quickly pick up pace. If you have any more info on the matter, please share with us in the comment section. Thanks for the tip Coral! Same problem, not getting options go forward, delete a SMS. No solution found so far.